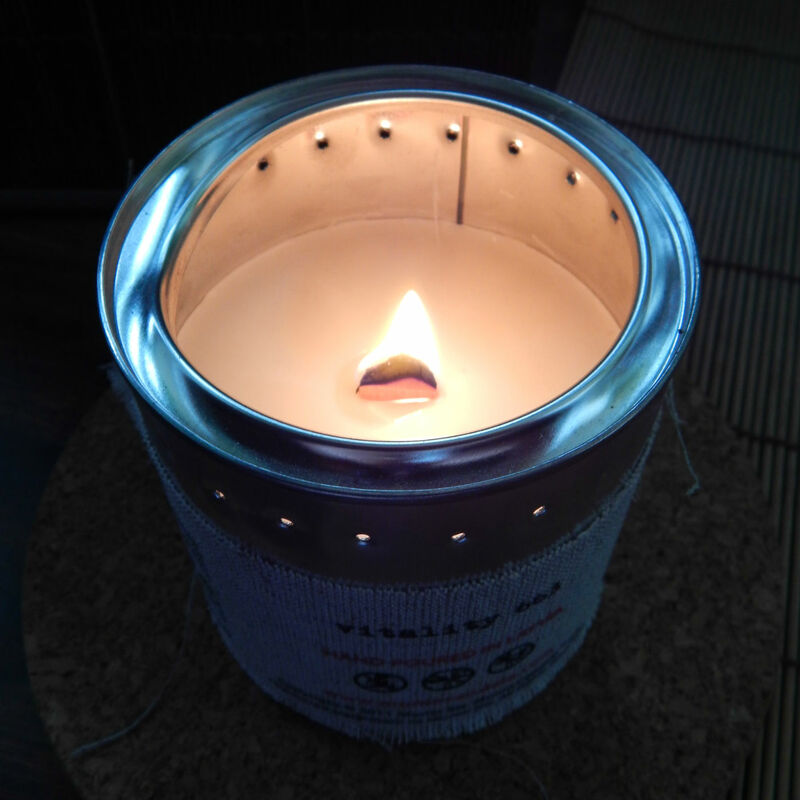 Last month when making MyPure choice I decided to be less selfish and picked something which all members of our household will enjoy – I decided to try Munio Candela Soy Wax Candle Poured in a Paint Can. First of all they look amazing – just look at them… I really like the combination of the shiny cold looking silver tin and the natural warmth of a canvas which goes around it. Lots of candles these days look nice but these one are just stunning. Secondly they are soy candles; I’ve never had a soy candle before so I really wanted to try it for myself. Munio Candela candles are completely handmade using only 100% natural all-soy wax, the finest lead-free all cotton and wooden wicks and herbs from the baltic countryside. Soy candles are simply better for you, your family and your environment. Better for the indoor and natural environment. Burns without toxins, carcinogens or soot. Burns up to 50% longer than traditional candles. Cruelty free, contains no animal products. Contains no genetically modified material. Biodegradable and derived from renewable carbon neutral sources. All these are very valid points, which made me want to try them. 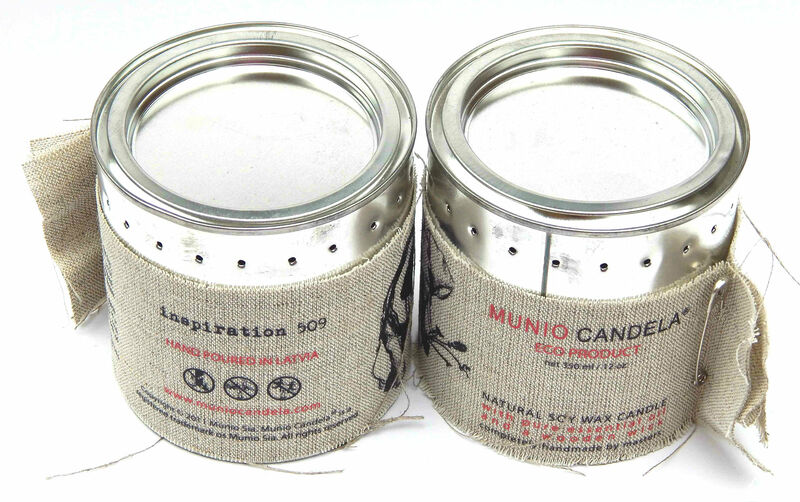 Munio Candela Soy Wax Candles Poured in a Paint Can are available in two scents: vitality and inspiration. They are supposed to improve a person mood, cognitive functions and wellness. They are fragranced with 100% pure essential oils. So how are they in use? Munio Candela Soy Wax Candles have a wooden wick, which I have never had the pleasure “to work with” before. I was wondering about how it will burn… surprisingly it burns pretty well and with no problems, but you might get some small pieces breaking off which will make your candle looking a bit dirty inside. Oh and they “talk”; it is not a quiet candle, you will hear some very subtle crackling of the wood as it is burning. Candle in a tin, isn’t this going to get hot? This was yet other question going through my mind before I used it… yet again surprisingly it doesn’t. After hours of burning (the candles are not supposed to be burned for more than 3-5 hours at the time) you are still able to lift it and move it around without the need for oven gloves. So far so good, but now we are getting into the scent… and here I have a bit of a problem… the scent is almost none existent. There is nothing wrong with my nose, I would even go as far as claiming that my smelling abilities of scents is much more sensitive than a “standard” person but I just don’t get these candles. I tried them both; I even put them very close by on a side table and still nothing. For me a candle serves a purpose on two occasions – I want to create a romantic environment and have dim lighting or I want to create a relaxing environment which is full of a soothing scent, or any combination of both. As much as I tried to love these candles in use, I just can’t. Due to the candle being in a tin and soy wax being much lower than the rim, you are not getting a lot of “light” coming from it… and as the scent goes… hmm… maybe they forgot to add some to mine. 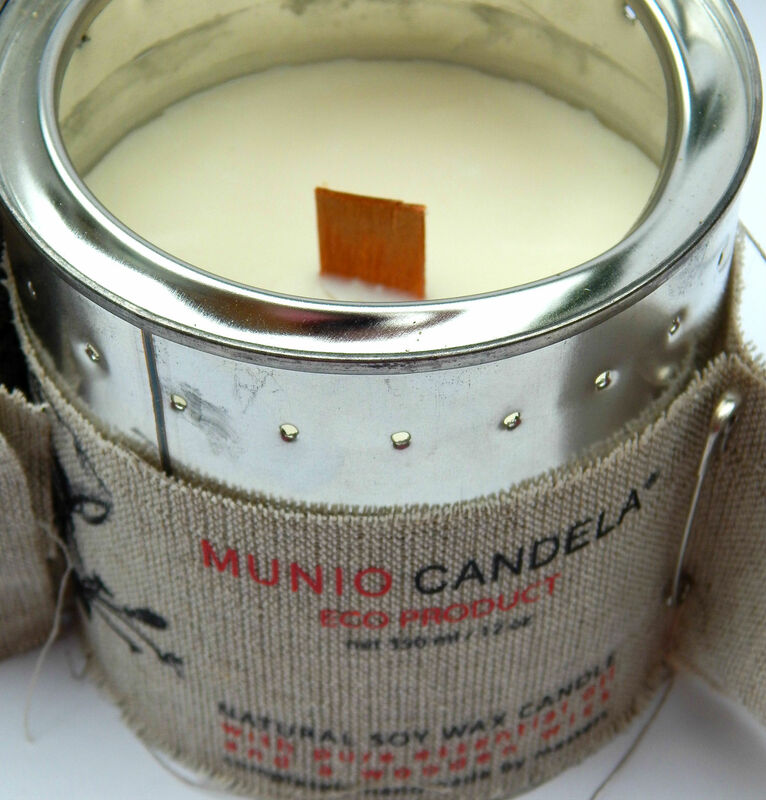 Munio Candela Soy Wax Candles Poured in a Paint Can are priced at £23 (currently on sale at £11.50), which is a lot for something which doesn’t work all that well. Despite that fact that these candles aren’t brilliant as a candle, they still look stunning and would make a perfect house decoration piece. What do you think – do candles need to have a strong scent or would you be happy with something so subtle that it is almost none existing? * Products featured in this post were provided for free by MyPure for review purpose. I do prefer something more subtle, personally. And I like the idea of a natural product like soy. The fact that they crackle is also appealing! I have to say, though, I’d never pay that much for a candle. My husband loved candles so I may give these a try. It is all in the fragrance for me so I like to try and ‘sniff’ them before I buy. They certainly look very cool. I have never heard of soy candles before ! i really wanted you to love these 100% so I had an excuse to head over to the website and buy some! Lol. It’s a real shame about the scent. I thought I was going to have a similar problem with a Body Shop one I picked up earlier this month, but luckily the scent ‘kicked in’ on it’s 2nd lighting. I love the look of this candle. Shame the smell but I prefer non-smelly candles unless it’s a more natural, subtle smell. I’m impressed it doesn’t get too hot. Oh these look different! We are Yankee people, but would be up for trying something different, I would rather have a candle than a lamp in the evening! These sound amazing, I love a good candle!